We have 42 pastors and evangelists who go to various villages to conduct Bible studies and share the gospel. Many walk for hours or wait for infrequent public transport. 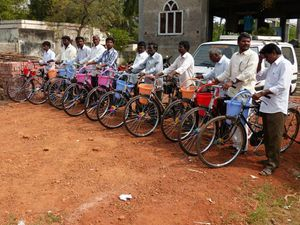 In 2011, a short-term mission trip team from Toronto felt the need to provide some bicycles for these church workers. Dr. Ken Tung provided $700 CAD to provide 10 pastors with bicycles. 5 of the pastors are pictured with Dr. Tung below. In 2014, a team from Alabama travelled to the SAM mission field in Eluru, India. 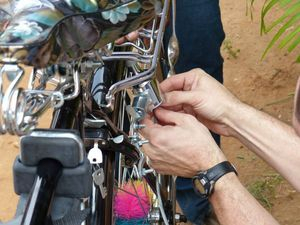 They installed bicycle generators onto pastors' bicycles in order to generate a light source for Bible studies conducted in rural villages. We thank God for their wonderful ministry! SAM is thankful to the friends in Toronto who have started this program. Further donations can be sent directly to SAM (via GCI Online Portal). After your donation is received, the name(s) of the pastor(s) provided with your gift will be sent to you.